Whether you’re celebrating a graduation, wedding, new home, or a new baby in the family, the new Milestones Collection of crochet patterns and organic merino wool blankets has you covered! All the blankets in this collection are created using O-wool organic merino wool yarn. 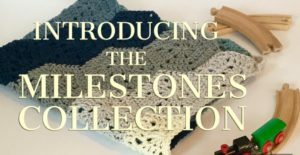 The Milestones Collection includes 6 unique crochet patterns for blankets or throws to celebrate life’s biggest moments, as well as crochet/yarn kits for the DIY-er who loves to receive a complete project in the mail. For those who prefer to purchase gorgeous handmade gift, the Milestones Collection includes a limited number of sumptuous organic merino blankets and throws, appropriate for all occasions. With the Milestones collection everyone is sure to find THE perfect unique gift that will be the hit of the party! Here is a video I created showcasing the crochet patterns and blankets that are apart of the Milestones Collection.